Defence and Military Veterans Minister Nosiviwe Mapisa-Nqakula used a one-on-one opportunity to tell the Commander-in-Chief of the SA National Defence Force (SANDF) how the country’s military machine was being treated by those with hands on the national purse strings. President Cyril Ramaphosa last week called on the Defence Ministry at Defence headquarters in the Armscor building in Pretoria’s near eastern suburbs. 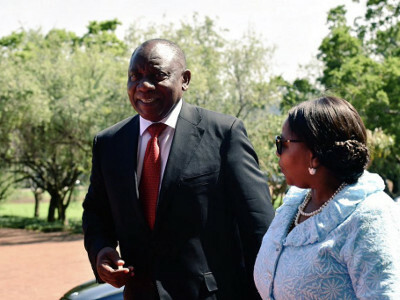 In addition to meeting the Minister and her team, Ramaphosa also met Secretary for Defence Dr Sam Gulube and Armscor chief executive Kevin Wakeford along with SANDF Chief General Solly Shoke and commanders of the national defence force’s four services – air force, army, military health and navy. Ramaphosa’s visit was in line with the announcement he made during his first State of the Nation address (SONA) in February last year. He told those gathered in the National Assembly – and the nation watching it broadcast live on national television – that he would visit “every national department to engage with the senior leadership to ensure the work of government is effectively aligned”. As far as can be ascertained last week’s Department of Defence call was the second made by the President since taking office. The first was to the Department of Co-operative Governance and Traditional Affairs (COGTA). According to the Department of Military Veterans’ website, Mapisa-Nqakula told Ramaphosa the Defence Review 2015, adopted by Parliament and the Cabinet, was the basis of South Africa’s “current defence strategy and planning in line with the National Development Plan (NDP)”. “There are several milestones in the Defence Review 2015 we are planning to achieve, especially against current fiscal constraints the country is facing,” she said, asking the President “whither the defence function in current times”. She answered herself saying the Department of Defence (DoD), including the SANDF, has to operate “within severe budget constraints imposed by National Treasury and government” and elaborated to the extent the national defence budget will be reduced by “no less than R5 billion” over the next medium term expenditure framework (MTEF). Mapisa-Nqakula mentioned “a few” ordered commitments the SANDF has been part of domestically, in addition to continental peace support operations. These include assistance to the Vaal and Emfuleni communities since late last year; youth development activities through the NARYSEC programme; collaboration with the Department of Agriculture, Forestry and Fisheries (DAFF); and construction of bridges in the deep rural areas at impassable points, especially in Eastern Cape, KwaZulu-Natal and Limpopo. Additional tasks allocated to the military include ensuring “our ships are at sea protecting the exclusive economic zone (EEZ); the safety of aviation and that our airspace is protected and South Africa is ready for any interdiction through the SA Air Force (SAAF); that our land mass is equally and fully occupied and protected through the Pride of Lions that is the SA Army and that all serving members and their dependents’ health is looked after through and by the SA Military Health Service (SAMHS)”.